An American Air Force family who was reported missing on Thanksgiving Day has now been found. The family of four was discovered inside their SUV which was damaged by a crash. 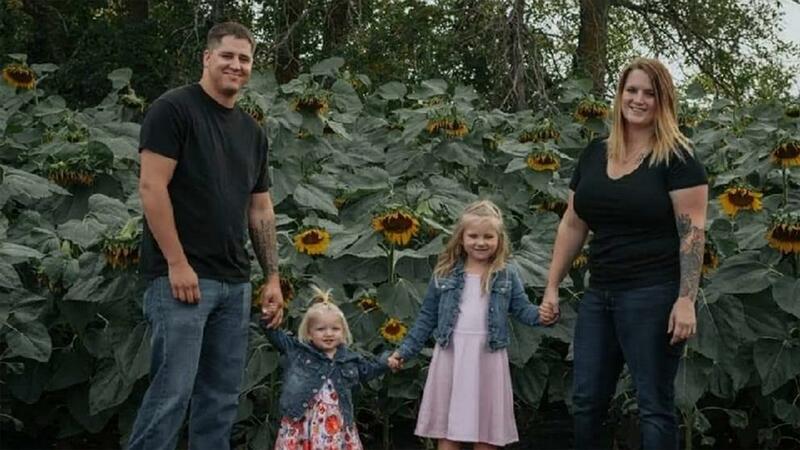 The Grand Forks Air Force Base says the family is from North Dakota but was killed in a crash in Montana when their vehicle went into a creek. The Air Force says that 25-year-old Staff Sgt. Anthony James Dean was assigned to the 69th Maintenance Squadron. Dean and his 25-year-old wife Chelsi Dean were traveling for the holiday when they were killed in the crash on Thanksgiving day with their 5-year-old daughter Kaytlin Merie Dean and 20-month-old daughter Avri James Dean. The couple is originally from Caldwell, Idaho but lived in Manvel, North Dakota where Dean was stationed at the Grand Forks air base. Anthony Dean was an RQ-4 Global Hawk crew chief. The crash scene was originally discovered by Montana Highway Patrol Friday night after a search that lasted since Thanksgiving. The Montana Highway Patrol says that the Dean family's Toyota 4Runner went off of Interstate 94 near Huntley, Montana. The Grand Forks Air Force Base Maj. Eric Inkenbrandt, 69th Maintenance Squadron commander said in a statement on Facebook, "Words are not enough during a time like this. AJ's family brought a light to our community, and this loss strikes each of us deeply. May their friends and family be granted strength and serenity to get through this sorrowful time." The Billings Gazette published photos of the family's vehicle trailer at the bottom of a steep ravine where the highway became a bridge. The family's 2017 4Runner was towing a trailer with a car on it when they crashed and speed is a suspected factor. The last time the family had any contact with the Deans was around 6:30 a.m. Thursday morning. The Dean family was traveling to Ekalaka to have Thanksgiving with Chelsi Dean's grandmother. Sheriff Neil Kittelmann of the Carter County Sheriff’s Office in Ekalaka, Montana confirmed the family's identity Friday morning and said the vehicle was traveling in the median for a distance before going airborne off an embankment between the eastbound and westbound bridges. The vehicle landed on its nose in Pryor Creek and investigators believe all four died at the scene. Possibly. But this is a typical MO of covering up a murder, by making it LOOK like an accident. Foul play is already ruled out? Vehicle traveling in the median for a distance before launching sounds like they were asleep.